K+K Weddings | no matter what your style is, we hope that you make your wedding truly yours. If you fully agree, we would love to meet and chat some more about your vision - we're excited to hear more! K+K Elopements | elopements + intimate weddings are our jam! 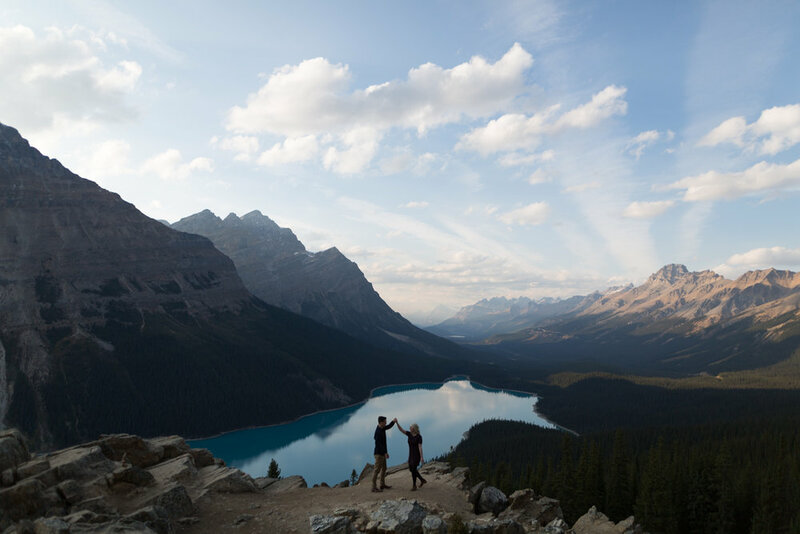 The beautiful Rockies are in our backyard but wherever you decide to elope, count us in. We'd love to hear all about it. K+K Couples | engaged, having an anniversary or just for the heck of it. Let's create something beautiful. To learn more about our 2019 Love Story Collections simply SAY HELLO. ONE | Say hello via our contact form or by writing us at hello@kendalandkevin.ca. TWO | Together, we review Collections + meet up for drinks (or setup a video call) to get to know one-another and see that we're a good fit. DO YOU SHOOT WEDDINGS TOGETHER? There are many benefits in having two photographers - we can split up when needed, have two sets of eyes meaning no detail is missed and maybe most importantly, we are able to capture each moment from two different perspectives. This results in a richer and more complete story of your day. Plus being husband and wife gives us that 'almost-annoying-ability-to-know-what-the-other-one-is-thinking' like chemistry which proves to be invaluable throughout the day, giving you an experience that's uniquely K+K. HOW DO YOU CAPTURE SUCH NATURAL MOMENTS? Your wedding day should be about you and your loved ones, not the photographers. We pride ourselves on blending in, visiting with guests and making sure everyone is comfortable so that we can capture the day's events as they naturally unfold. About 90% of your day will be captured candidly and soon enough you won't even notice the cameras. YOU SHOOT CANDIDLY BUT WILL YOU ALSO PROVIDE DIRECTION? We're looking for authentic interaction and honest emotion. We will step in to give guidance and always put you where the light is most flattering but it’s a collaboration, really. Our biggest tip is to try and be vulnerable - It’s those real moments that make stunning photographs. And don’t worry, it's natural to be nervous at first. Trust us, we've been there on our wedding day... so we always make it fun! WE HAVEN'T DONE THIS BEFORE AND DON'T HAVE A PLANNER, CAN YOU HELP? This is where we step in. All of our Collections include location scouting and we are happy to suggest awesome locations, whether it be in the City or out in the Mountains. WHAT IS A 'FIRST LOOK'? AND IS IT RIGHT FOR US? A first look is pretty simple - it's a private moment for the bride and groom to see each other for the first time, prior to the ceremony. Is it right for you? It's completely up to you, but we love them. They're relaxed, giving you both time to take it all in and it often lends to more flexibility in the photo timeline. 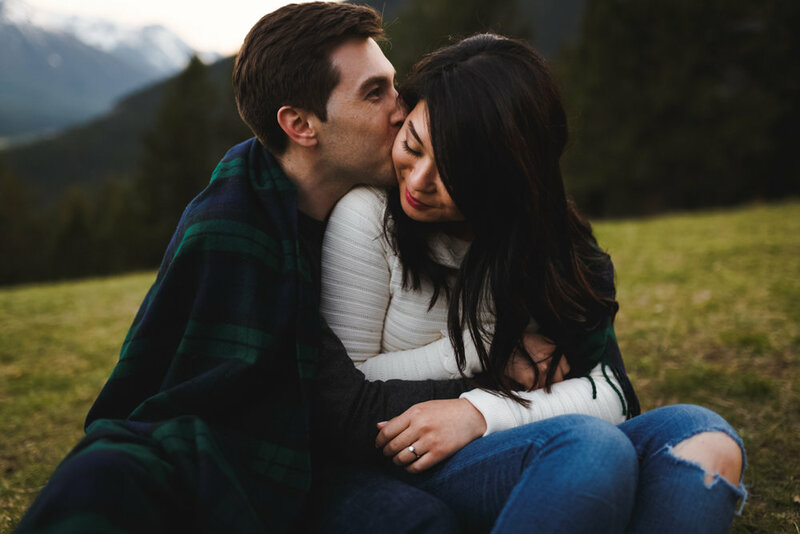 We recommend having an engagement session for a couple reasons. First - you get to see how we work and it's a great way to settle any nerves you might have. And second - it's an awesome opportunity to capture you guys as a real couple... doing real couple stuff. We would suggest as soon as you have your date + venue confirmed. Typically it's about a year in advance for full weddings. Absolutely. The majority of our work takes place next door in the Canadian Rockies but we're always excited to travel and shoot somewhere new. Get in touch about a custom quote, we're excited to hear about your plans! DO YOU SHOOT URBAN WEDDINGS? Of course! We think the city is pretty cool too. You will receieve a personal online gallery where you can download the images directly and/or order prints via our online shop. WHEN DO WE GET TO SEE OUR COLLECTION? Wedding Collections are delivered within 8 weeks and other Lifestyle Sessions within 3 Weeks. Keep an eye on our Instagram Page for Sneak Peeks. Certainly! We have an online print shop where you can order prints, booklets and albums! We have teamed up with some pretty awesome vendors to bring you only the highest quality goods. WHO IS THE BOSS? KENDAL OR KEVIN? Easy... Brighton runs the show. We're lifestyle photographers, which to us, means capturing love and life candidly and letting moments unfold naturally. A mix of photojournalism + fine art, we are ready to give direction when it's called for. In the end, there will always be some joking around + good times... we like to think we're essentially 'friends with cameras'. We're Visual Storytellers. We photograph with purpose, capturing authentic moments as they happen. Focusing on your love, our images elicit joy, warmth and happiness. Using light and shadows to capture the true essence of your day. In our final steps, we carefully curate your Collection into a story to share with loved ones for years to come. "Kendal + Kevin are literal creative geniuses. We eloped at Emerald Lake Lodge from Ontario and they went above and beyond what is expected of photographers. They helped with our timeline, suggested amazing locations for photos and made personal recommendations for things to do on our honeymoon, and they even signed as our witnesses! ... Our photos turned out amazing. No... Amazing is an understatement. There isn't even an adjective I can think of to accurately describe how happy we are with every single photo we received back from them. I may have audibly gasped - and no I'm not being dramatic lol. They were just that insanely beautiful. We are so happy with our decision to book with them. Booking Kendal + Kevin was the second best decision we made for our wedding, next to marrying each other of course :) I thank the universe that our paths crossed. Kendal and Kevin - we seriously love you guys." "How do I begin? When we decided to get married, photography was our #2 priority for our wedding (only behind the actual love and stuff). I spent hours researching photographers all over Canada and the US (who would travel) before we found Kendal + Kevin. I instantly fell in love with their style and how "real" their work is. From the initial contact with them, we knew they were right for us. They asked all the right questions to get to know us. They were incredibly helpful in guiding us through a process we knew nothing about and giving us information/the rationale behind ALL our photography options. They are in the business to make their clients happy, even if that means using a photographer who is a better fit for someone (which is highly respectable). They were super easy to work with and answered any questions we had promptly. They went above and beyond, even helping us to pick our ceremony location since we were "eloping" from the US. They were flexible after our initial plans changed several times. On the day of the wedding, they made me feel at ease and very excited. Everyone in my family was super impressed and relaxed around them because they are SO NICE. The photos truly captured our personalities and the vibe of our day. Even the "posed" family photos (you know, the ones your parents are worried about) are very relaxed and beautiful. I cannot recommend these two enough. All my love to Kendal+Kevin!" "We used Kendal + Kevin for our engagement and wedding photos and we cannot say enough great things about them and their work. We also had a great time working with and getting to know them both - Kendal and Kevin are both extremely talented and they are such kind and positive individuals. They are the kind of team that after you spend some time with them, you can just feel how much they love each other and how well they work together. A perfect combination and their work definitely shows it. We are proud to have Kendal and Kevin as our photographers and now our friends. Highly highly recommended!"